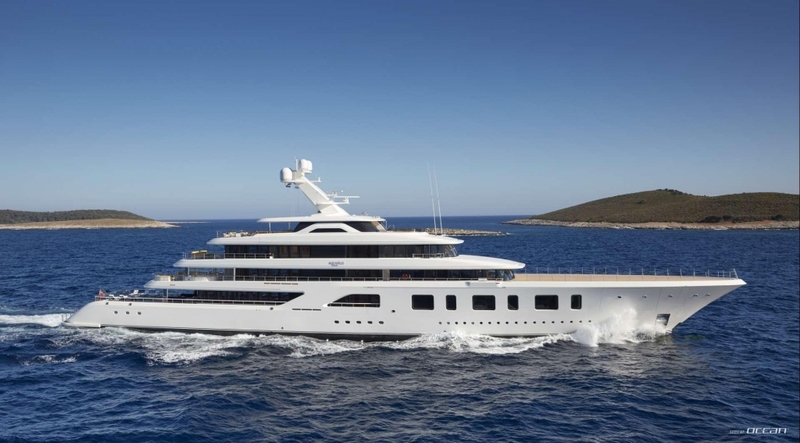 Luxury motor yacht AQUARIUS 92m Feadship is now available for charter. With exterior design by Sinot Exclusive Yacht Design and naval architecture by De Voogt, AQUARIUS yacht for charter features a Sinot interior in collaboration with the owners own design team. The result is the ultimate superyacht charter experience without compromises to comfort and luxury. AQUARIUS 92m Feadship yacht accommodates up to 12 guests in 7 staterooms and comes with an unparalleled service provided by a crew of 31. One of her most distinguishing features is the dedicated owner's deck complete with the full beam master suite boasting a private terrace as well as a private massage room and media room all with floor-to-ceiling windows providing spectacular views. The latter has been one of the leitmotivs when designing charter yacht AQUARIUS as the ample use of glass sections have been seamlessly integrated into the superstructure of the yacht. Megayacht AQUARIUS has two spacious main saloons offering lounging and formal dining areas. Both provide access to deck lounges as well as an al-fresco dining area and the 7m swimming pool on the main aft deck. Other superyacht features are the elevator connecting all decks, spa and a gym with shell door opening at sea level. It goes without saying that 92m AQUARIUS yacht for charter carries an armada of water toys.